It is early evening. It is quiet here in Montmartre, still a bit too early for dinner. The light outside is getting dark and grey now that the days are getting shorter and colder. He plays the piano, so beautifully -- he is playing one of the songs from Chocolat, one of my favorites, a piece by Erik Satie -- while I look through photos of our visit to Chantilly earlier today. Later, he will go and get some take-out kebabs for dinner "in". All is well. New memories flicker through my mind: touring the chateau, his hand on the small of my back as we listen to the tour guide; of walking hand in hand through the gardens and forest; of our lovely lunch in the tiny faux hameau on the grounds of the chateau; of our deepening conversations, confiding more bits and pieces of our lives to one another, discovering we are in sync about so many things we both want for the future. There is something about being together that already feels like home. As I write, the cat sits companionably next to me on the arm of the canapé, purring in contentment. 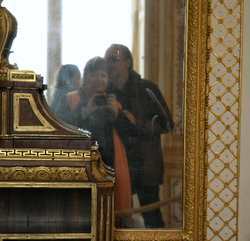 Photo of Georges and I reflected in an antique mirror at Chantilly.